Teacher Tom: "Ahhh . . ."
He is forever messing around with water both indoors and out. 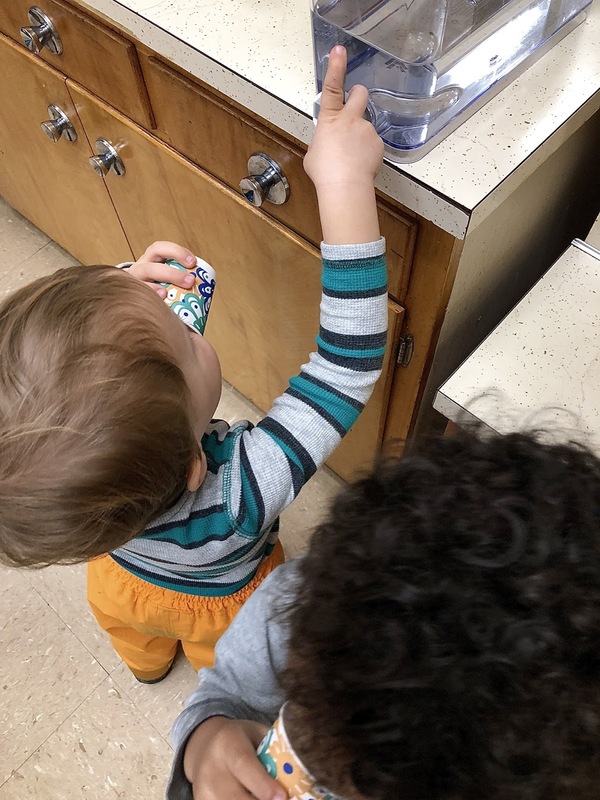 When there isn't proper "play" water available inside, like in the sensory table, he finds some anyway, usually by washing his hands for a very long time or by monkeying around with the water fountain. Last year, as a two-year-old, we found we had to push the filtered water dispenser out of his reach so that we didn't wind up mopping the floors several times a day, but this year, his three-year-old year, we really want the kids to be serving themselves and so, despite the occasional mini-floods, he's had daily access to the apparatus. As a cooperative school, the parent-teachers rotate through the responsibility for managing snack service which means he's had any number of teachers when it comes to our self-serve water. He's done it "wrong" quite often, usually the moment the adult supervisor has turned her back, not seeming to really care about the mess he'd made until recently. In fact, he's usually been fully absorbed in watching the flow of water hit the floor, then spread in all directions. Yesterday, he said, "Teacher Tom, I'm getting water." He positioned his Dixie cup under the spout, something he had previously sometimes failed to do. He manipulated the spigot precisely, something he had previously sometimes failed to do. Then he said, "I just want one drop," then managed to turn the flow on and off so quickly that, indeed, it only dispensed a single drop, which he showed me proudly before downing it. He served himself one drop again and again, alternating with friends who were after the more traditional "full" cups, savoring each tiny sip with an, "Ahhh." It had been a process that had frustrated a few adults, one that involved lots of paper towels, but here he was, through dozens of "mistakes," enjoying the pleasure of being the master of the water dispenser, so in control that he can manage a single drop. This is the story of learning in preschool, every time. Sometimes we only get it wrong once, sometimes the process is accelerated by observing others, but sometimes, for some of us, it's a longer journey of trail and error. It's not usually the "easy" route, but when we're allowed to travel it in our own way, at our own pace, the destination is most often a satisfying, "Ahhh," before we set out on the next.